The S-400 "Triumf" is one of the most sophisticated surface-to-air missile systems in the world. It has a range of 400km (248 miles) and one S-400 integrated system can shoot down up to 80 targets simultaneously. In October, India signed a $5bn (£3.9bn) deal to buy five S-400 regimental units. That amounts to at least 320 missiles. 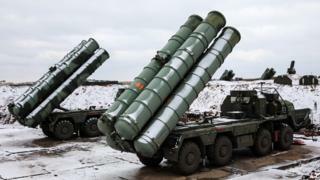 Each S-400 launch vehicle - a heavy lorry - carries four missiles. "We made the S-400 deal with Russia, so it's out of the question for us to turn back. That's done," Turkish President Recep Tayyip Erdogan said.